1. Create a new report form. 2. 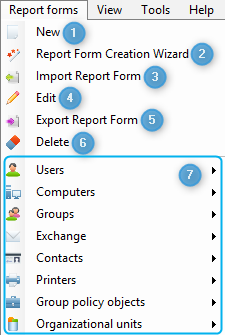 Create a new report form using Report Form Creation Wizard. 3. Import an XML file with the report form parameters. 4. Edit selected report form. 5. Export selected report form parameters to an XML file. 6. Delete selected report form. 7. 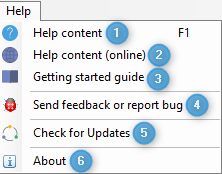 Shortcuts to all report forms. 1. Switch to dashboard view. 2. Switch to the report view. 3. Show Getting started guide. 4. Send feedback or report a bug. 1. Go to the Main window. Useful when you have opened lots of reports. 2. Active AD connection can be changed if needed. 3. Shortcut to Connection manager. 4. Shortcut to Task manager. 5. Close all open report tabs. 7. Email the Albus Bit support team. 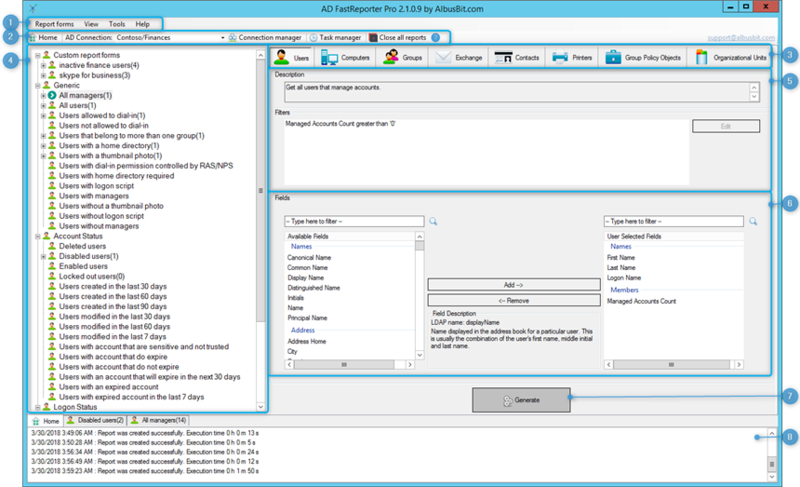 Select the required report category from these eight options: Users, Computers, Groups, Exchange, Contacts, Printers, Group Policy Objects and Organizational Units. List of report forms for selected report category. Select the report form you need. Description can be used to easily find the report you need and to understand what result it will generate. It shows report filter conditions in easy-to-understand language. 2. Full available fields list. 3. Add field from available fields list to display fields list. 4. Remove field from display fields list and put it back in available fields list. 6. Full display fields list. 7. Selected field LDAP name. Last selected field from available or display fields list. 8. Selected field description. Last selected field from available or display fields list. Shows info, warnings and error information.